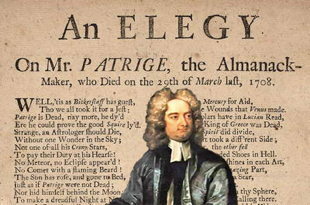 In early 1708, a previously unknown London astrologer named Isaac Bickerstaff published an almanac in which he predicted the death by fever of the famous rival astrologer John Partridge on March 29 of that year. 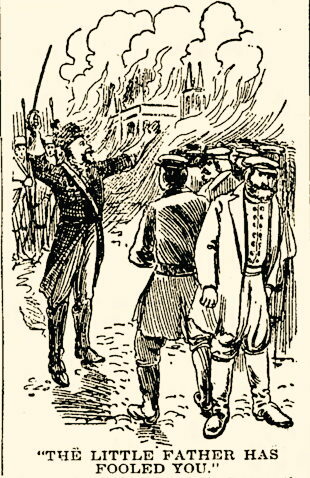 Partridge indignantly denied the prediction, but on March 30 Bickerstaff released a pamphlet announcing that he had been correct: Partridge was dead. It took a day for the news to settle in, but soon everyone had heard of the astrologer's demise. And so, on April 1st the joke came to full fruition (suggesting it was a deliberate April Fool joke) when Partridge was woken by a sexton outside his window wanting to know if there were any orders for his funeral sermon. Bickerstaff, it turned out, was a pseudonym for the satirist Jonathan Swift. His prognosticatory prank worked so well that Partridge was eventually forced to stop publishing almanacs, unable to shake his reputation as the man whose death had been foretold. Olof Toreen (1750) The Swedish explorer Olof Toreen wrote in his account of his "Voyage to China" that his ship set sail on April 1, 1750, but that "the wind made April fools of us," and they were forced to take shelter in the Danish port of Skagen. Peter the Great’s April Fool (1719) According to legend, Peter the Great introduced the custom of April Fool's Day to Russia in 1719 (or perhaps 1718 or 1723 — sources differ) when he ordered an immense pile of wood to be erected in the open square in front of his St. Petersburg palace and then had it set on fire early in the morning of April 1. From a distance it looked as if the palace were on fire, and people rushed from miles away to help put out the blaze. They were met by troops at the edge of the square who told them, "The Little Father has fooled you. It is the first of April today." Though reportedly the fire brigade that showed up got better treatment. They were rewarded with beer and brandy. The First Newspaper April Fool (1774 or 1789) There are two different stories that describe the first April Fool's Day hoax by a newspaper, but both stories claim it was a German paper. 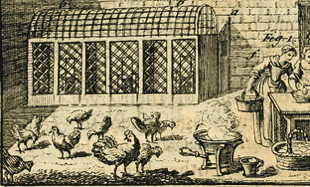 The first story claims that in 1774 a German paper claimed it was possible to breed chickens of various colors by painting the area in which the mother hen lived. The hen would supposedly pass on the color of her surroundings to her offspring. The second story claims that in 1789 a Berlin newspaper reported that hailstone the size of pigeon eggs had fallen on the streets of Potsdam, which caused hundreds of curiosity seekers to go to the town hoping to see this unusual weather phenomenon. Of course, no hailstones were seen. Neither story has been confirmed. 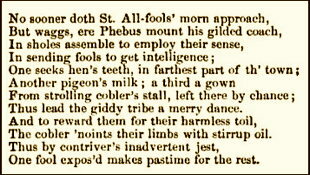 Poor Robin’s Almanack (1738) The 1738 edition of Poor Robin's Almanack (a popular satirical English publication) included a poem that described the various fool's errands that pranksters would trick victims into pursuing on April first. These errands included being asked to find such things as hen's teeth or pigeon's milk. 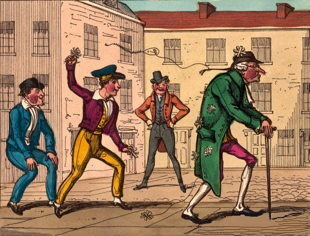 Street Pranks (1770) An illustration from around 1770 depicts London youths making fun of an old man on April 1 by tying a kite to his hair. During the 18th and 19th centuries, it was common for young people to celebrate April Fool's Day by playing pranks on strangers in the city streets. It was for this reason that the holiday was often greatly disliked by the older, more respectable members of society. 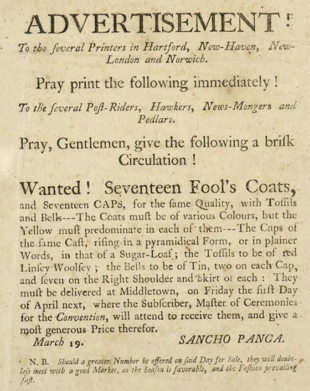 A handbill requesting the delivery of 17 fool's coats and caps to Middletown, Connecticut on April 1 for a convention (presumably of fools) was printed up and distributed in various New England towns. The handbill was signed "Sancho Panca," which is almost certainly a pseudonym. Its author may have been Moses H. Woodward, who was the only printer in Middletown in 1796. 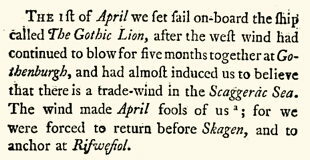 This is the earliest known American reference to April Fool's Day.